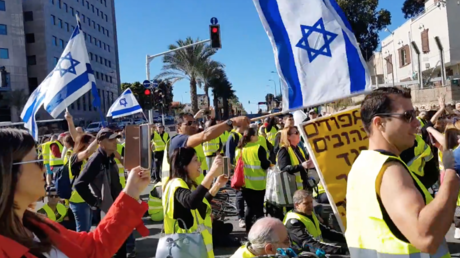 Outraged by the rising cost of living and price hikes on basic services, Israeli citizens who were inspired by the French Yellow Vest movement took to the streets of Tel Aviv demanding concessions from the government. Wearing bright fluorescent yellow vests, symbolic of the French grassroots movement, some 600 Israeli activists blocked the Azrieli intersection and adjacent roads in the city center, accusing the government of “robbing” the people. The social protest movement, which claims it is not politically motivated, is expected to rise in the coming weeks, after the National Union of Israeli Students called for a mass mobilization in Tel Aviv on December 22. As the Israeli capital gears up to face citizens’ discontent, the Knesset’s Economic Affairs Committee will meet next week to discuss commodity prices. מחר הם מפגינים בגדר עם אפוד צהוב או אפוד מגן או גם וגם ? France, meanwhile, is bracing for the fifth round of Yellow Vest protests on Saturday, after a set of economic concessions announced by President Emanuel Macron to address the social grievances failed to fully appease protesters.